In moments of danger, new mamas will go to extraordinary lengths to protect their babies. From developing superhuman strength to free babies trapped under cars, to risking their own lives to ensure their little ones are safe. Any new mama will tell you about the deep instinctive need to protect her newborn from harm, and the fact she would do anything to keep her baby safe. What you might not realise, is babies can work a little lifesaving magic of their own. One newborn baby, Rylan, helped to save her mama’s life last year when doctors were running out of options. Shelly Cawley slipped into a coma during childbirth in September 2015. The doctors weren’t hopeful, as Shelly had very low blood pressure and her heart rate was way too fast. The new mama was hooked up to a ventilator, and her family were preparing themselves for the worst. The hospital staff decided Shelly needed something to fight for, if she could hear and feel her newborn baby, they thought she might begin to fight. Rylan Grace Cawley, just a few hours old, was called in for help. The baby was stripped off and placed on her poorly mama’s chest. Knowing she was home, Rylan fell right asleep in the comfort and warmth of her mama’s body. When the baby cried out, her mama’s vitals jumped, and doctors felt reassured that Shelly had had the push she needed. 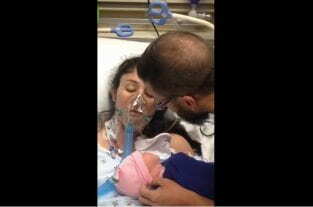 Shelly’s husband, Jeremy, spent the next week helping his new daughter to bond with her mama despite the coma. Rylan spent a lot of time snuggled up on her mama’s chest, and Jeremy learnt how to use a breast pump to express breast milk so Shelly would be able to breastfeed if she woke up. A week later, Shelly woke up and was able to meet the beautiful baby girl who played an important role in saving her life. Watch the mother and baby’s first meeting below.